The objectives will be met by providing merit bursaries to prospective and current undergraduate students. Merit bursaries will automatically be granted based on final Grade 12 results. 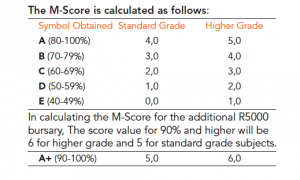 M-Score (All students who matriculated prior to the year 2008) The M-Score will only be calculated on the six best Matriculation subjects obtained. Students with an M-Score higher than 30 must apply at the Bursaries for the additional R5000. APS Score (All students who matriculated in the year 2008 and later) The APS Score will only be calculatedon the best seven grade 12 subjects obtained. In the calculation of the APS the score for Life Orientation is divided by 2. If the outcome amounts to a 0.5 the outcome is rounded up (e.g. 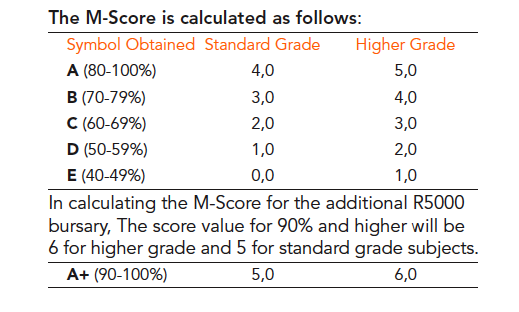 7/2=3.5 the score will be 4).In calculating the APS score for the additional R5000 bursary, the score value for 90% and higher will be 8. Students with an APS Score higher than 46 must apply at the Bursaries for the additional R5000. 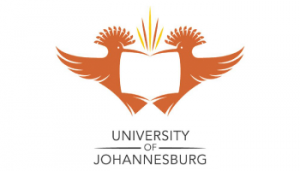 These students must apply for this bursary by completing a UJ bursary application form. The principal of the school/college must confirm the position in writing before the award will be made. These students must apply for this bursary by completing a UJ bursary application form. Written proof of the achievement must be supplied before the award can be made. Application forms for cultural bursaries are available on request from the Cultural Office, T110, UJ Arts Centre, 011 559 2034. Sports bursaries are awarded by the Sport Bureau. Application forms are available from their office. 011 559 3070. Application forms are available on UJ web www.uj.ac.za. Refer to the External Sponsor Bursaries and Loans booklet for more information. Refer to the External Sponsor Bursaries and Loans Booklet for more information regarding bursaries.